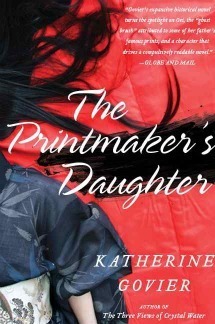 The legendary printmaker Hokusai created Japan’s best-known image, The Great Wave—but the story of his daughter Oei comes to life for the first time in this vivid historical novel, combining scholarly detective work and a daring narrative that shines fresh light on issues of authorship, duty, and the tender and inscrutable bond between a father and daughter. This is a beautiful piece of writing that really captured my attention right from the opening pages. Oei is a larger than life character, full of spirit and vitality and I was drawn into her story as soon as she appeared. The world we see through her eyes is vividly described with a wonderful attention to detail that helps bring the characters, time and places to life. It is clear that this story and the period have been well-researched and yet the history never overtakes the story; rather it adds depth to it and supports it. I did enjoy reading the afterword, which put the story into perspective and gave the reader insight into how much of the story was based in fact and how much was fiction. The pacing of this book is superb and there is never a dull moment, the prose is simple and beautiful and very atmospheric at times and the characters are engaging and memorable. In fact, I don't have one bad word to say about this piece. I am sure it will be a big hit with fans of both literary fiction and historical fiction. It may also be of interest to those who are keen on Japanese art. This is a book that I could definitely reread and still take something new from it each time.